How do I buy a Gift subscription? It's easy to subscribe online for a Gift Subscription -- just go to our Subscription page, select the type of subscription, be it Print Only, Digital Only or a combined Print+Digital sub, then, tick/check the box on the right that says 'Gift for a friend'. Add To Cart, and fill out the requested information boxes. Go To Checkout and pay. NOTE: You do not have to enter the giftee's delivery address. They set that up themselves when they redeem the gift voucher. 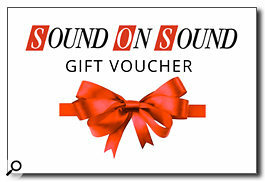 Gift VoucherAfter submitting your order, you will receive a Confirmation Email to the email address you entered. You will also receive a second email which contains a Gift Voucher in the form of a PDF for you to print out and pass on to the giftee. Alternatively, you can just forward them the email with the PDF attached. This code may only be redeemed once by whoever you pass it to (there is no charge to the redeemer) More information at www.soundonsound.com/giftcode. During the redemption process, the redeemer has the opportunity to enter their delivery address and email. Gift Subs are not created automatically when purchased. Note: Cross-border gift subscription are not available via the web site. If you wish to purchase a gift for someone in a different country please contact us direct via this support form.